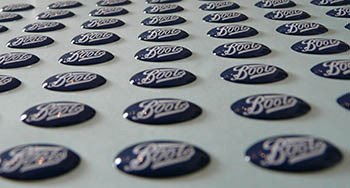 To meet tremendous quality standards, we are offering a quality range of Dome Sticker. The Dome Sticker we offer is highly demanded for their safe use. Our products are widely demanded for its availability in various sizes and designs. Moreover, offered products are known for their fine adhesion. Lucky Plastics is one of the reliable manufacturers of Smart Card Products, Binding & Lamination Material, and Badge Clips. Our product range includes Neck Lanyards, Printed Neck Lanyards Types, Functional Binding Machine, Smart I.D. Card Cutters, Spiral, Double Loop WIRO and Lamination Pouches & Rolls. Our products are widely appreciated for the features like durability, cost-effective prices, and reliability. These are extensively used in Medical, Paper and Printing Machines.